Sadly, on the 15th May 2009 one of the true gentlemen of the Australian Entertainment Industry passed away. Bud`s career spanned 70 years, in all facets of film, theatre and of course radio. I have waited a while to write this, it has been a tough one for me personally. When the TV announced that Bud Tingwell had passed away from Prostate Cancer, I was in hospital having just had Radical prostate removal after having been diagnosed with an aggressive version of the disease. In fact I was released on the day of his funeral. My wife had given our children strict instructions not to tell me, but hospitals have television. Australia's favourite Grandfather had passed away. Much has been said about the passing of Bud Tingwell, but we will be a bit different from the rest, we will discuss his radio work. 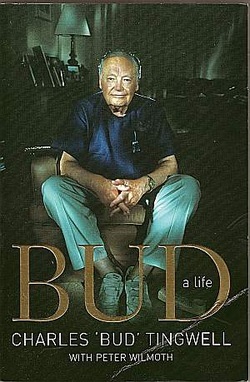 My research partner with documenting Australian Radio Production, Moris Sztajer, had spoken to Bud late last year and he was trying to organise a time to sit down with him to compare notes with what we had on Bud's radio career and what Bud remembered of those Golden years of radio in Australia. We left it too late. Whilst we have documented hundreds of Series/serials/plays that Bud appeared in, pinpointing the exact role can often be difficult. Australian Radio Actors were great at 'voices' and it can make it hard to pick them at times. I had sent Bud a list of radio shows we knew he was in and the roles we had confirmed for him, as well as the blanks for the roles where we hadn't identified his part in the cast. Unfortunately we never got to finish filling in the blanks. 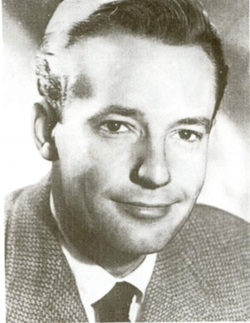 Bud's own website http://www.budtingwell.com.au/archive_radio.php listing his radio career, also misses important self-contained series that he appeared in, Grace Gibson Productions The Clock in 1955 is a good example. It is missing from Bud's list, however Bud is named in the cast at the end of episodes in lead roles and you can pick his voice in the parts. We are fortunate in that a surprising amount of Bud's radio work has survived. Whilst more than 90% of Australian Radio Production from the period of Bud's radio career no longer exists, we do have surviving shows right from his first radio work "Billy Bunter" (What role?) in 1939, just after we first started recording in Australia. I have already mentioned "The Clock" which was a 52 episode series of self-contained episodes with a mixture of drama styles. Bud appeared in 5 of the episodes as one of the absolute cream of Australian radio actors of the time and the series remains one of my favourites. In fact most of the cast of The Clock were also cast in the movie 'On The Beach'. Bud also appeared in serials which remain part of Australian remembered history, Smoky Dawson, Blue Hills, Dr Paul and When A Girl Marries. Radio plays which were movies with the listener providing the pictures, were very popular, the cream of Radio play production were Lux Radio Theatre, Caltex Theatre, General Motors Hour, Harry Dearth Theatre, Harry Dearth playhouse, Kool Mint Playhouse, as well as many others. Bud appeared under all of those banners and quite a few of their individual plays. in Australian WWII Naval stories. Of all the series/serials and plays where Bud featured, it is sad to note that one particular serial of 208 episodes, where he played the lead, 'Phantom Ranger' stands out as having no surviving audio examples. Perhaps an episode or two will show up in the future. Charles 'Bud' Tingwell had a mighty radio career and very few Australian Actors would have appeared in a larger variety of roles, the list is awesome and I for one still look forward to listening to Bud for many more years to come. My condolences to his Children, you have a right to be proud of your Dad. We are indeed fortunate that this great book was written. I highly recommend it to fans of Bud's career.